After having played the first week of our Heralds of Ruin campaign, I found some motivation and did a little painting. 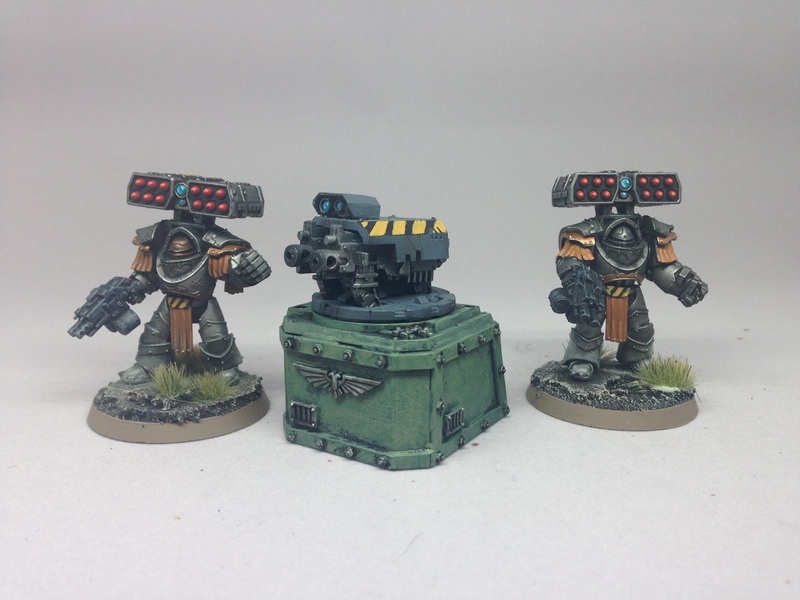 I had already painted one of the Siege Tyrant Terminators, but needed two for my 250 point kill team. I evidently didn't write down my paint scheme, which is unusual for me, so I had to sort of guess on the leather strips. I think it's a pretty good match. I painted the one guy's head bronze just to be able to differentiate which is the Team Leader. The only real difference between them from a game standpoint is that the one guy has an extra wound and an extra point of leadership. I also knocked out the Heavy Bolter upgrade that I get to use in each game due to my base upgrade. I still need to paint a Meltagun Dude as well as an Apothecary, and then my 250 point Kill Team will be fully painted. The Meltagun Dude will be painted exactly the same as all the Bolter Dudes. The Apothecary will probably just get a white helmet and maybe some white elements on the back pack and Narthecium.